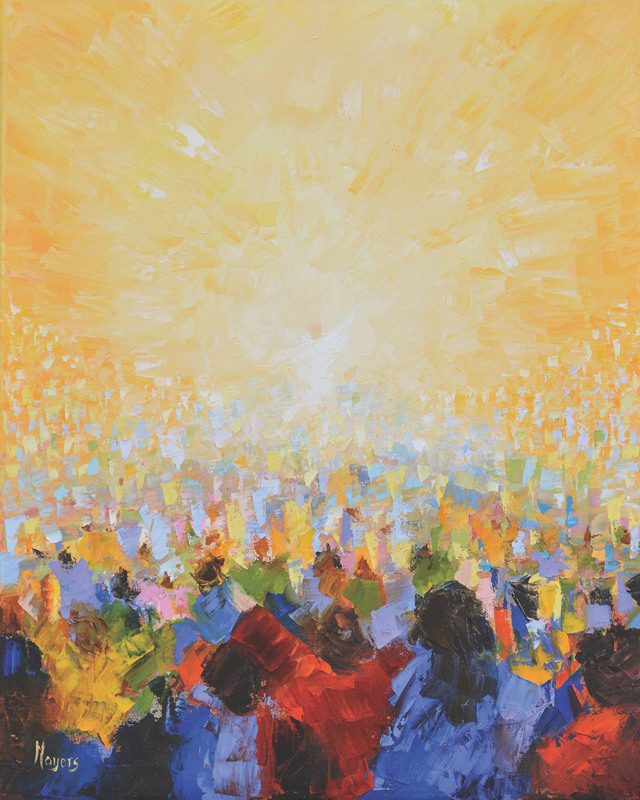 “Hallelujah” by Mike Moyers, MikeMoyersFineArt.com (used by permission). As we follow Zephaniah’s words over these verses, we behold Jesus Christ, our Risen Savior. We behold the Lord of Lords and King of Kings. This day of Resurrection. This day of new creation. This day of death vanquished by life. Over the past month and a half, we’ve journeyed through the stories of God’s people in the wilderness. Over the past week, we’ve journeyed from the last supper with the disciples to the betrayal in the garden, to the trial in the city, to crucifixion in the wasteland. Jesus goes to the cross alone. His disciples betray him, deny him, and abandon him. The church remembers these stories in prayer, worship, and action as we remember that we are the unfaithful ones, we those who have denied and crucified our Lord. But now. The long night of Holy Saturday has come to an end. Matthew tells us that the two Marys come to the tomb of Jesus at the dawning of the first day of the week. As the new day dawns. The heavens shake, the earth quakes, the soldiers tremble, the women fear, and the angels speak, Do not be afraid, for I know that you seek Jesus who was crucified. 6 He is not here, for he has risen, as he said. (Mt 28:5–6). To help us grasp but a glimpse of the joy in this day, let us hear the words of the prophet Zephaniah. This little tiny book is a prophecy about the day of the Lord. In his opening words, Zephaniah terrifies with some of the darkest words in all of Scripture. The day of the Lord has come and it is awful. His words sound like the flood of Genesis only worse. For God will not only sweep away humanity, animals, and birds, but this time he will also sweep away the fish of the sea. All creation has fallen under the judgment of sin. The result of idolatry, of trusting in idols and human wisdom and human power over the grace of god has led to devastation. King Manasseh son of King Hezekiah, has sacrificed his own son for prosperity. Zephaniah prophecies against a world given over to every human desire and resulting in oppression, murder, violence, perversion, destruction, and eventually complete and total devastation. When we look around our own world, we can see the end result of unrestrained human desire: sexual slavery, wars, violence, domestic abuse, road rage, and much more. Destruction and devastation abound. As a result of human evil, Zephaniah sees the Day of the Lord come as a ravaging judgment that sweeps away all life on earth. And now the mystery that I cannot begin to fully grasp. In the Gospel story, we learn that God Himself in Jesus Christ, takes this judgment over all creation upon Himself. The swift and terrifying Day of the Lord comes and Jesus steps into the whirlwind of repercussion caused by human sin and rebellion and bears every bit of it. Down into the grave. Down into the silence of Holy Saturday. And now, we see the two Marys walking toward the tomb at the Dawn of the new Day. As the new day dawns. The heavens shake, the earth quakes, the soldiers tremble, the women fear, and the angels speak, Do not be afraid, for I know that you seek Jesus who was crucified. 6 He is not here, for he has risen, as he said. (Mt 28:5–6). In Christ, the day of the Lord is no longer a day of trembling, a day of terror, a day of absolute devastation, for now the Day of the Lord has become the day of salvation, the day of the rejoicing, the first Day of New Creation. Weeping may have endured throughout the night, but now the day of rejoicing has come. As we follow Zephaniah’s words over these verses, we behold Jesus Christ, our Risen Savior. We behold the Lord of Lords and King of Kings. All those under the judgment of sin, Rejoice. The Lord Himself has borne your judgment. The judge has vindicated you and driven away all your enemies. And the angels at the tomb cry out, “Fear not.” For fear has been taken captive. The King has come. He is your defender, your protector, your intercessor. Fear has no power in the presence of the King of Kings and Lord of Lords. Then we behold Jesus as a mighty warrior. Even now, the Might One of Israel stands in your midst, ready to save. Now Zephaniah beholds our Lord as husband, as bridegroom who delights in His Beloved. Throughout the Old Testament the love of God is called the hesed of God. The longsuffering, the lovingkindness, the merciful, the graceful love of God. But here Zephaniah speaks of the ʾahăbâ of God. This os the passionate of love of Jacob for Rachel. The Lord delights in His Beloved. In you, He rejoices over you, He sings over you, He shouts you and even dances over you, He loves you beyond words, He loves with silent delight. Zephaniah is not done. He continues to exalt in our Lord and Savior. Now He beholds the Lord as our loving Father who clears our name. so that you will no longer suffer reproach. Zep 3:18. He is gathering, leading you to the place of joy. Now we see our Lord as shepherd, gathering up his lost and dying sheep. The lame cannot even walk into the house of the Lord because of their own damaged bodies and souls. The outcast are forsaken, abandoned, forgotten. Outside of the loving grace of God in Jesus Christ, we are those lame and blind and deaf and outcast. We cannot save ourselves. We are helpless in our sin. But the Lord our Shepherd is gathering us even now to Himself. He is turning our shame into praise. The Lord is gathering His lost children to Himself. He is lifting up His people for all the powers to behold, His masterpiece, He beautiful workmanship, His Beloved. Even now we ourselves who hear these wondrous words enter into the joy of our salvation. For This is the day that the Lord has made. We will rejoice and be glad in it. All who are broken by sin come and find forgiveness in Jesus Christ. All who are weary find rest in the Lord. All who thirst find living waters. All who hunger find satisfaction. All who grieve find comfort. All who are lost come home to Him. Behold your salvation is at hand. The Lord is here and He is mighty to save. Let us rejoice in the Lord our God!